In the absence of a scientific explanation, the apparent disappearance of the Sun (or the Moon) during an eclipse would be a frightening event. Throughout history, eclipses have been seen as a disruption of natural order, and many thought they were bad signs. Many ancient peoples had spiritual explanations (which are popular today) for solar and moon eclipses. In this article, we introduce you how the eclipses explained five civilisations all over the planet. In ancient China, it was believed that solar eclipses arose when a celestial dragon attacked and devoured the Sun. China's eclipses are among the oldest in the world, dating back over 4,000 years. In fact, such an account explains the eclipse of the Sun in a very simple way: "The sun was eaten". To drive the dragon and save the Sun, people beat the drums and made loud noises during the eclipse. Since the Sun always came back after such manifestations, it is easy to understand why this tradition has been perpetuated. Interestingly, it seems that the ancient Chinese were not too disturbed by the moon's eclipses. A text around the year 90 BC. describes them as "unimportant events". Hindu mythology offers a disturbing explanation for solar eclipses. According to the legend, a demon named Rahu wanted to drink the nectar of the gods and thus become immortal. Disguised as a woman, Rahu tried to take part in a banquet of the gods and was discovered by Vishnu. As a punishment, the demon was immediately beheaded, and his head flying in the sky covered the Sun during the eclipses. Some versions of the story say that Rahu has managed to take a nectar mouth but was beheaded before the elixir reaches its limbs. His immortal head, which always follows the Sun, sometimes catches it and swallows it. But the Sun is always coming, because Rahu has no throat to swallow it. The Incas worshiped Inti, the Almighty God of the Sun. They believed that Inti is generally benevolent, and solar eclipses are a sign of his anger and discontent. After an eclipse, the spiritual leaders tried to find out the source of the god's wrath and establish what sacrifices should be offered to him. Though the Incas rarely used human sacrifice, I thought eclipses required this supreme gesture. During the eclipses, fasting was common and the emperor often retired from public life during and after such a cosmic event. According to a legend of the Choctaw tribe, a black and cunning squirrel who ate the Sun was the reason eclipses appeared. As with the Chinese dragon, the squirrel had to be driven away by the deafening noise of the people who witnessed the eclipse. Ojibwa and Cree tribes believed in the story of a boy (sometimes represented as a dwarf), named Tcikabis, who wanted to revenge the Sun because he had burned it. Despite his sister's protests, the boy caught the Sun in a trap, causing an eclipse. Several animals have tried to free the Sun from the trap, but only the mouse has managed to rope the ropes and release the star. Batammaliba are an ancient people, originating from the northern states of Togo and Benin. 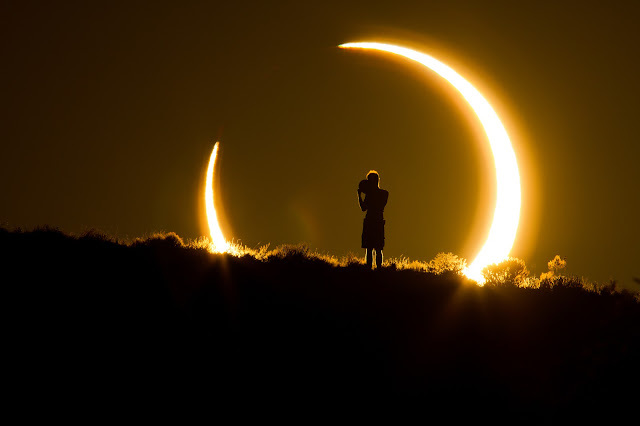 According to the legend, the rage and struggle between humans came to the Sun and the Moon, which began to fight each other and caused an eclipse. The rulers of the people, Puka Puka and Kuiyecoke, asked the villagers to show the Sun and the Moon that they were reconciled to persuade the heavenly bodies to stop their struggle. That is why, even now, during the eclipses, the Batammalib indigenous peoples end the old quarrels and unite to encourage the stars to make peace.